McDonald's Restuarnt Re-Imaged Open House. 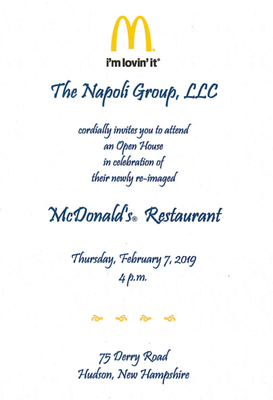 The Napoli Group, LLC cordially invites you to attend an Open House in celebration of their newly re-imaged McDonald's Restaurant at 75 Derry Road in Hudson, NH on Thursday, February 7th at 4 PM. On Friday, February 8th from 11 am to 1 pm, WFNQ-Frank 106.3 will be doing a live radio remote. 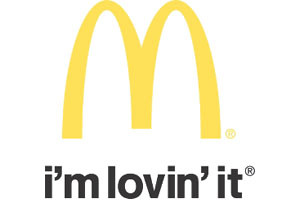 McDonald's will be donating 10% of all sales from Friday, February 8th through Sunday, February 10th to the H.O. Smith and Library Street Schools. There will also be a donating of $1,000 to the Hudson Parks & Recreation Department at the actual Ribbon Cutting on Thursday, February 7th. The Hudson Police Department will be at McDonald's on Saturday, February 9th from 12:00 pm through 2:00 pm for a meet and greet demonstration.